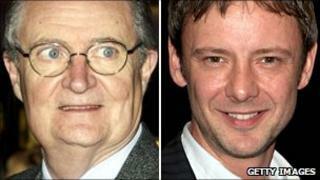 Actors Jim Broadbent and John Simm are to star in a new psychological drama on BBC One about a father and son who get caught up in a scandal. Simm plays a London journalist who returns home to be reunited with his father, who has Alzheimer's disease. Their lives are turned upside down as Simm's character Tom seeks to find the truth behind events from 18 years ago. Three-parter Exile, scripted by Shameless writer Danny Brocklehurst, begins filming in Manchester on Monday. Harry Potter star and Oscar winner Broadbent, 61, and Simm, 40, who has been appearing as Hamlet at the Sheffield Crucible and starred in Life on Mars and Doctor Who, will be joined in the cast by veteran actor Timothy West. Executive producer Nicola Shindler said: "The combination of intense thriller and beautifully observed family relationships, and the chance to work with two of Britain's best actors, is a rare opportunity." She will be joined by Shameless creator Paul Abbott as an executive producer.